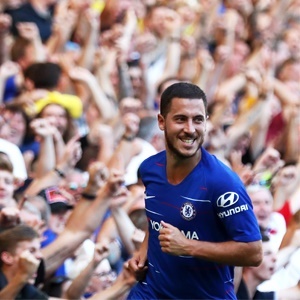 Cape Town - Real Madrid target Eden Hazard remains focused on seeing out the season with Chelsea, not worrying about where he will be next season. Reports are growing that Hazard has no intention of penning a new deal with the Premier League side and will push for a move to Real when the transfer window opens. However, the Belgium international is refusing to say what the future holds and is focusing his efforts on trying to help Chelsea finish in the top four and win the Europa League. Hazard put on a stunning display against West Ham on Monday and hopes that proves where his loyalties are for now. "I'm just focused on Chelsea," he told ESPN. "One month to play, top four, try to win the Europa League. "For the fans I think the most important thing is when they see me on the pitch they just think that my head is with Chelsea. So, we'll see after." Real have a lengthy list of transfer targets for the summer and there is no doubt that Hazard is high on it, but much will depend on how Chelsea finish the season and whether or not they will remain under a transfer embargo for the next two windows.